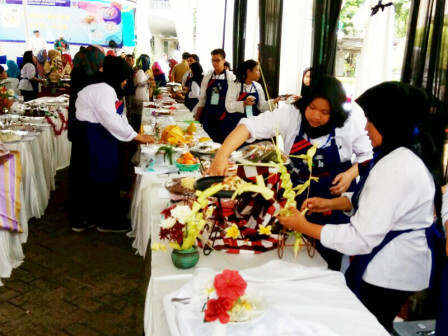 The West Jakarta Maritime, Agriculture, ad Food Security Sub-agency is holding fish cooking competition which is participated by 32 teams, consisting of 22 groups of family welfare movement (PKK) and 10 groups of vocational school (SMK) students.
" My goal is to get experience and hopefully my aspirations to become a chef can come true"
As experienced by Prisca Aprilia, a 11st grade student from SMK YMIK Joglo. She was very enthusiastic in participating in this competition, as she was able to show her skill in processing cuisine. "My goal is to get experience and hopefully my aspirations to become a chef can come true," she expressed. Even it gets appreciation from West Jakarta Mayor, Rustam Effendi. "Every participant must be creative in processing fish to be an interesting and can be appetizing. I hope the next year's event can attract more participants," he uttered. West Jakarta Maritime, Agriculture, and Food Security Sub-agency Head, Marsawitri Gumay added that the winner will represent West Jakarta at the provincial level. "Then winners at provincial level, will represent Jakarta in a similar competition held by the Ministry of Fisheries and Marine," he said.